This is an unedited alphabetical list of peer to peer lending platforms spanning all lending verticals that operate in Europe. 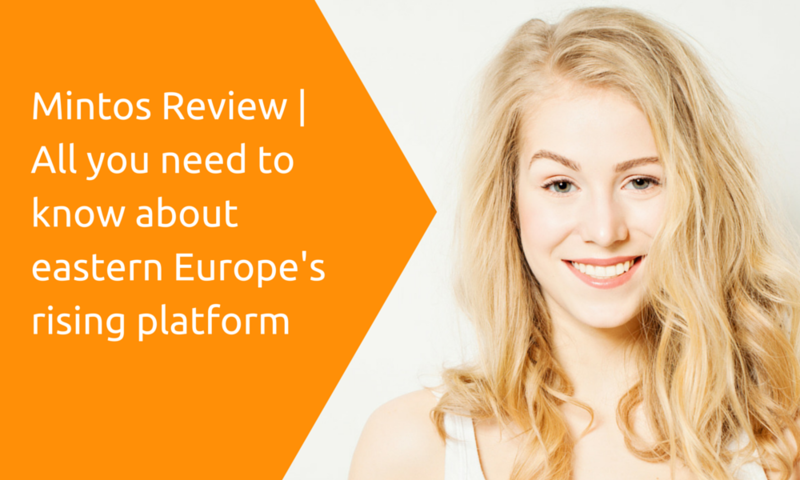 Many of these platforms are smaller compared to the big three in the UK (Ratesetter, Zopa and Funding Circle). The list will continue to be updated with new platforms. Bondora is also one of the more popular platforms. Over 41,912 people have invested over €157M and earned €20M. With Bondora, investors become the bank. BULKESTATE – it is the first platform of group real-estate investments and purchases in Latvia. Despite the fact that our head office is located in the capital of Latvia — Riga, we work with real-estate objects in all three Baltic states. We offer to earn with us, by investing funds in real-estate projects with annual return on investment of up to 15% and profit withdrawal period from 3 to 24 months. Additionally, the minimum investment amount is 50 euros. Crowdfunding Investment Platform – You can invest in business, real estate and energy projects from 100 EUR. Debitum Network is a P2B platform which allows anyone to invest in business loans from as little as €50 and earn interest from 9 to 11 %. All investments carry an additional guarantee for all investments. Loans are assessed by independent 3rd party risk assessors. There are 0% fees on the platform for investors. All investments are accepted instantaneously. Debitum Network allows depositing of EUR and GBP, as well as cryptocurrencies of ETH and DEB tokens. EstateGuru is a peer-to-peer lending platform for property loans, where users can borrow and lend money to fund real estate projects. As of 2016 EstateGuru has 3885 investors from 27 countries, with an average return for investors of 11,2%. All loans are secured with mortgage. Mintos is one of the most popular peer to peer platforms operating in Europe. They provide retail investors with an easy and transparent way to invest in loans originated by a variety of alternative lending companies around the world. PeerBerry is a peer-to-peer marketplace offering an opportunity to invest in issued non-banking lenders loans from across Europe. The portfolio of loans on offer primarily consists of consumer loans originated by Aventus Group and its subsidiary companies. VIAINVEST is a peer-to-peer lending platform offering private lenders/individuals and legal entities an opportunity to invest into short-term consumer loans originated across Europe. VIAINVEST provides investors an access to non-bank lending sector by creating a safe and transparent investment environment where investors are able to earn up to 12.2% p.a. on their capital. To maximize the investing experience VIAINVEST has developed several important features, such as a Buyback Guarantee and auto-invest option to make the investment process reliable, simple and seamless. Todays post is by Chris Grundy of Bitbond. Chris is a Bitcoin obsessive and avid p2p lending fan who has written for a variety of Online publications as well as regularly contributing to the Bitbond blog. You can follow him on Twitter, connect with him on LinkedIn or check out his Marketing blog. Any feedback is welcome and encouraged. It is fair to say that the p2p lending industry is having a stellar year. As you will be aware, Lending Club reported an extremely successful Q2, breaking through $1.9 billion in originations in that quarter alone. During the same time period, Prosper issued a staggering $912.4 million in new loans, representing a 147% increase year-over-year! The U.K. is equally as impressive with $792 million being lent over p2p platforms in Q2 according to the Peer-to-Peer Finance Association. So how can you take part and profit from the p2p lending boom? Well, the first thing you need to do is find the right peer to peer lending site for you in order to start investing and saying goodbye to the 2.5% interest offered by your bank. Below, I have listed my favourite peer to peer lending sites from around the world for you. Have a look and let me know in the comments if you think I have made any glaring oversights. Enjoy! Using bitcoin as a payment network, Bitbond gives investors access to higher interest rates from around the world at zero fees. Below is a table comparing fee structures across platforms. Besides the minimal fees, Bitbond offers the AutoInvest tool (video) which allows larger investors to set clear investment parameters and then automate the investment process, saving time as well as money. Potential bitcoin investors might also be won over by the weekly borrower interviews which are published on the company blog, and let lenders to read up on the people they might want to invest in. The average interest rate on Bitbond currently stands at 25% and you can invest as little as $2.50. Check out Stu Lustman’s quarterly returns reports to see a comparison between fiat and bitcoin ROIs for lenders, and have a look at one of the most lucractive bitcoin affiliate programs around. I think it is fair to say that Lending Club is the favourite among U.S. peer to peer lending sites. Industry heavies such as Simon Cunningham (Lending Memo), Peter Renton (Lend Academy) and Ryan Lichtenwald from this very blog (and Lend Academy), have all extolled on the platforms virtues and have recorded their impressive ROI’s, coming in at 13.3%, 11.30% and 10% respectively. Average investors can expect to enjoy a healthy ROI of 6-8%, which might seem a little disappointing when compared to the professionals, but should nevertheless be considered very attractive. Lending Club also let you invest $25 per investment which makes it possible to further diversify a smallish investment total, and have a very good credit scoring system in place. Prosper suffered a rocky start. Not controlling pricing in the early pre-crisis years really hurt their returns in the critical 2006-08 period. Prosper also fought the SEC on who should regulate the industry and paid greatly for it. Having put this behind them however, the peer to peer lending platform has enjoyed explosive growth in recent years. This growth comes mainly from Prosper’s newly acquired reputation as being a very solid way of earning extra cash. Since 2006, they have paid more than $140 million to their investors, with average ROI ranging between 5-9%. Additionally, Prosper’s evaluation of borrowers and the subsequently high quality of loan requests has helped build their reputation as a safe haven for investors. Specifically, their average credit score for borrowers is an impressive 700. Upstart might not have the same loan volume of the two giant peer to peer lending sites in the U.S. but it has some interesting characteristics that may well make it intriguing for investors. One of the biggest bugbears p2p investors usually have at Lending Club and Prosper is that when a loan defaults it is the investors, not the platforms that take the hit. With Upstart’s approach, if a loan defaults at any time over the course of the loan term, then Upstart will take the revenue they earned from the origination fees and refund the money to investors. Upstart’s origination fees range between 1% and 6%, which may well prove an attractive remuneration for peer to peer lenders who have seen an investment go south. With this in mind, expected ROI for investors is significantly below the previous platforms, coming in at 4-8%. Peer form is one of the oldest peer to peer lending sites on this list, despite only coming to prominence recently with another successful round of funding. Special features of Peer Form include their emphasis on accredited or institutional investors and their focus on three-year loan terms. Interest rates stand between 7-28% with over 14 different loan grades. Borrowers must have a minimum FICO score of 600 in order to apply for a loan, and as of today, there are about 70 loans on the platform with a majority of these commanding 20%+ interest rates. Kiva came up with a really good social idea. It is an US non-profit organization with the mission to connect people through lending, with the main goal of alleviate poverty. Kiva was founded in 2005 and has up to 1.382 lenders in 83 different countries. In just 5 years, Kiva has distributed over $240 million borrowed by more than 620,000 people around the world, contributing to the improvement of about 615,000 lives. 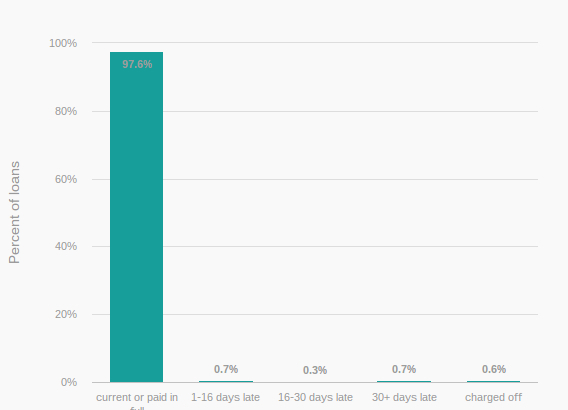 Of that borrowed amount, only about 1.58% has not been fully paid back. Kiva’s work is pretty interesting. It works with microfinance institutions all around the world – whom they call Field Partners. One of the reasons why this project is so successful is related to the fact that one can only donate as low as $25. It seems like Faircent is up to the challenge, raising $250,000 in a pre-Series-A funding in June, and recently raising an undisclosed fee from Mohandas Pai. Perhaps unsurprising considering that 78% of Indian population does not have access to personal loans from banks or NBFC. Since it’s inception, Faircent has processed over 300million Indian Rupees, around USD4.6million and boasts average interest rates of over 20%. In India, asset classes are few and tightly managed from a risk/return perspective, and not many asset classes exist where high earnings can be made. The returns on peer to peer lending sites like i-lend represent a welcome change therefore, bringing in between 16% to 20,75% on average. With this in mind it is important to note, that peer to peer lending is still unregulated in India, meaning that lenders have much less protection here than in other regions covered on this list. That being said, p2p lending clearly has a huge amount of potential in India. 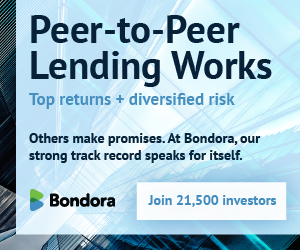 Bondora is one of the most exciting peer to peer lending sites out there today. This is because of its documented high yield returns for the 9,000+ investors who have signed up. Perhaps the most prominent among these is Claus Lehmann, (wiseclerk) author of p2p-banking.com, who has documented his returns from the European p2p lending platform. 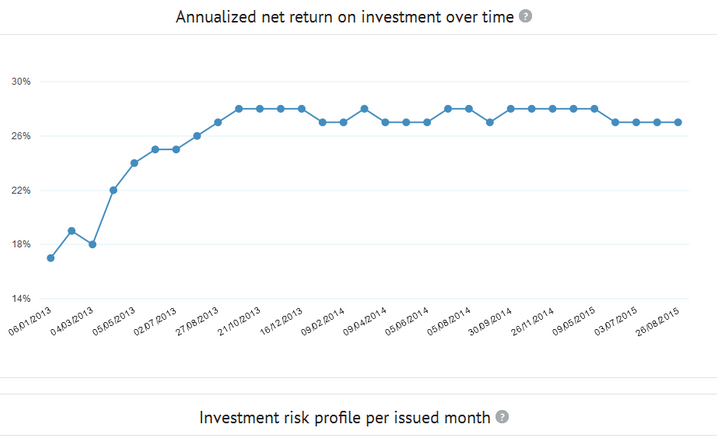 Below is a screenshot of his returns in which he showcases his average of 26% ROI on Bondora to date. Bondora has issued over €45 million in loans since 2009 and serviced over 100,000 borrowers across 3 countries. 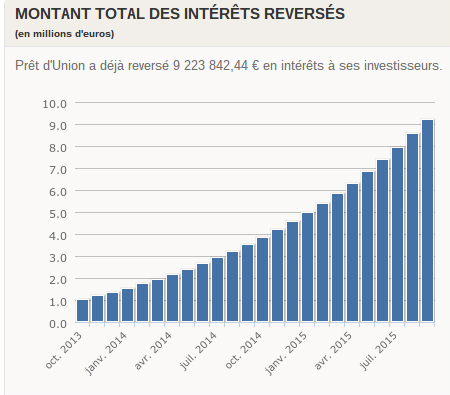 Prêt d’union, founded in 2009, has become the largest peer to peer lending site in France, having granted €228 million in personal loans so far, and paid out over €9 million in interest to investors. Having grabbed $34 million from Eurazeo, Pierre Kosciusko-Morizet as well as existing investors in July of 2015, Pret d’Union is perfectly placed to expand into the rest of Europe and become the continents dominant force. Yields for lenders are superior to those offered by banks, but mild in the p2p lending climate at 4-7.5%. For more information check out this interview with CEO Charles Egly. Aux Money is currently Germany’s biggest peer to peer lending site, which has reportedly financed over 32,000 loans totalling a volume of more than €180 million, since its inception in 2007. Despite the relatively low loan volume, when compared to it’s US counterparts, Aux Money is perhaps the most dominant regional p2p lending platform in the world, with a study (untertaken by Händlerbund) suggesting that the German lending giant commanded 2/3 of the domestic market. 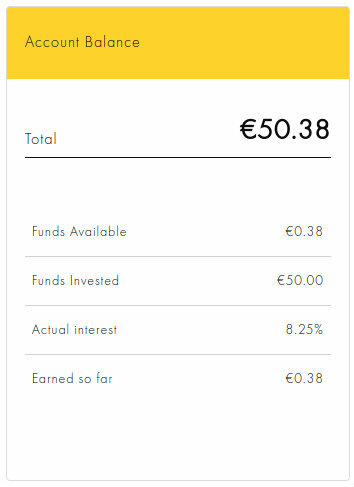 Investors can expect to pay 1% of their invested amount as a fee to Aux Money, while borrowers pay €2.50 a month plus a one-time fee, 2.95% of the total borrowed amount. Returns for lenders average 6.7% per annum, with investments usually ranging between €3,500-€4,500. Interestingly Aux Money has an acceptance rate for borrowers of 20% meaning that only 400 of the 2000 daily applicants are accepted and are allowed to publish a loan. Good news for the roughly 13,000 active investors. Lendico is a Berlin-based peer to peer lending site which was founded in 2013 by the ubiquitous German incubator Rocket Internet. Having expanded to Spain, Poland, Austria, South Africa and the Netherlands, you could argue that Lendico is the first multinational p2p lending platform. 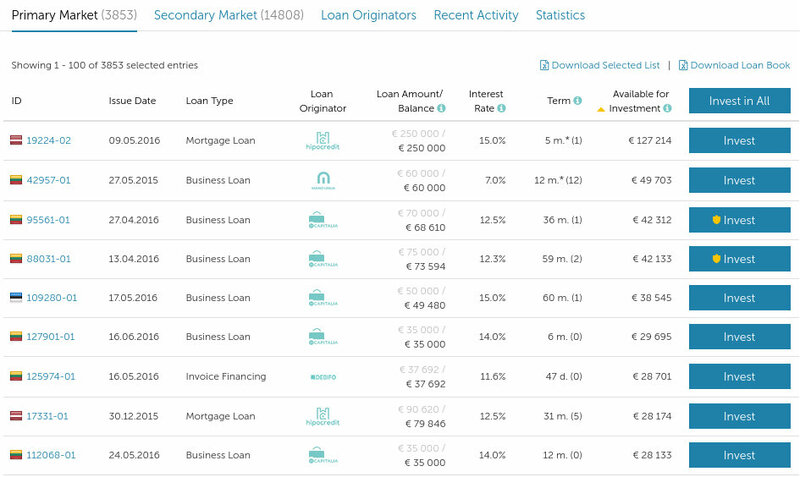 Loans on the platform are SME or personal loans and fall somewhere between €1,000-€150,000 in Germany. As on many other platforms, the perceived creditworthiness of the borrower determines the interest rate he has to pay, and the subsequent ROI investors can expect. At present interest rates can be considered mild in the current climate, starting at 2% and climbing to 8.8% for the highest risk borrowers. Zencap is another great example of the rude health of the European peer to peer lending industry, having raised €230 million in investments from Victory Park Capital in June of 2015. Flush with cash, Zencap now aims to provide small and medium sized business located in Germany, Spain and Netherlands with €5,000 to €250,000. Intriguingly, Zencap is another Rocket Internet company, meaning it is in direct competition in the p2p lending space with its sister Lendico. For investors, loan terms range from 3 months up to 5 years, with the latter being the backbone of the business. Experiences on the platform seem to be mixed, as German investor Martin R. explains in a guest post for p2p-banking.com. 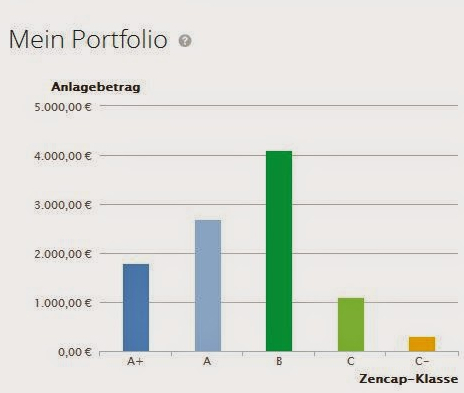 With yields of around 5.7% Zencap will have difficulty competing with alternatives such as Bondora, Aux Money. Below you can see a screenshot of his portfolio diversification across credit ratings. Martin, despite his diversification, like most other investors on Zencap, did no experience any defaults on his investments. With a relatively week ROI however, this might be expected. Cashare is the leading platform in the expanding Swiss p2p lending space, which grew by a respectable 36% in 2014. Interest rates on the platform usually lie between 7.7% and 9.9% with 58 loan requests currently available for investment. Additionally, Cashare supplies loans to applicants with varying purposes, whether to finance their education, pay their medical bills or hire a nanny, meaning that lenders can find higher interest rates if they wish to up the risk. Having raised close to $30 million in several funding rounds, Smava is the up and coming peer to peer lending site in Germany, despite being a presence in the space since 2007. Since then the German p2p platform has facilitated over €150 million in loans, with an annual ROI for investors of around 6.7%. Smava has a couple of cool features which make it interesting for investors such as the “bidbot” (Bietmaschine) which can be set to invest your money automatically along parameters you choose. Unfortunately, Smava has the highest fees for investors I have seen in Europe. 1.35% of the total invested amount is taken off as a fee. Borrowers can expect to pay 2.5-3% as a fee. Mintos is perhaps one of the most exciting peer to peer lending platforms in Europe today. With over 14,574 registered investors and boasting an average ROI of 12.86%, Mintos is definitely seem to be making all the right moves. What makes Mintos special, is its use of collateral. As investor Marco Schwartz wrote in his guest post, every loan is attached to collateral, meaning that if a borrower should fail to repay, whatever item he or she placed as collateral will be taken to reimburse the investors. Interestingly, Mintos also offers to buy certain bad loans back from their investors. Thus, if you invest in one of the specified loans, and the borrower defaults, Mintos will buy back the bad debt at a reduced price, but leaving you a little less out of pocket. Smartika is a p2p platform that was founded in Italy in 2008. Back then the p2p lending system was not well understood and well seen by banks and institutions in general. It took Smartika four years to get the right regulation and finally at 2012 it was a fully licensed Payment Intermediary, authorized by the Bank of Italy to operate in the p2p field. The italian platform is now doing quite well: they just exceeded 20 million loans, with an average rate of return of 6% and about 5,791 active lenders. In an interview, Maurizio Sella, CEO of Smartika, talked about his beliefs on the exponentially growth potential of the italian p2p market. Prestiamoci is another italian p2p platform, founded in 2014 and also authorized by the Bank of Italy to operate in the p2p field. The platform has already funded about 175 thousand euros, with the average revenue margin of 4%. For now, Prestiamoci has more than 450 lenders and disbursed 360 loans so far. The startup is supported by Digital Magics, an italian business incubator. Responsible for investing on Prestiamoci and for providing strategic support to it, the incubator has accomplished a gain of 300% on the transaction. Zopa will always be the first peer to peer lending platform! A pioneer in the field, the UK-based website has seen losses increase in 2014 however, despite a sharp rise in revenue. Still, Zopa’s importance for the UK p2p lending ecosystem can not be overstated. They processed $408 million worth of loans in 2014, which makes their European counterparts pale in comparison. With current monthly returns for investors of 0.7% to 0.8%, Zapo is still a little away from the 9% ROI their CEO aspires to. RateSetter has had a stellar 2014 and is now the largest peer to peer lending platform in the UK, processing over €400 million in 2014 alone. Backed by the star fund manager Neil Woodford, RateSetter has doubled its revenues in the space of a year. Boasting an annual return of 6.1% to investors, it might be a little difficult at first to see how the platform has enjoyed such explosive growth. If you keep digging however, you quickly realise that the low interest rates are indicative of the safety (low default rates) experienced by lenders throughout the 6 year loan terms. With the long loan terms in mind, we may well see a upward correction in default rates on RateSetter, as loans mature and default probabilities rise. Until then, RateSetter will stay a force to be reckoned with in the UK peer to peer industry. Assetz Capital is one of the UKs leading peer to peer lending sites, with over 10,228 registered investors on the platforms. Having just exceeded its fundraising target of €2.5million in May of this year, and recording 300% year on year growth, Assetz Capital looks to have a bright future ahead. What makes Assetz Capital special, is its focus on providing loans to SMEs and property developers in the UK. Consequently, the p2p lending site focuses on larger loans averaging around 400k. Thincats is a p2p lending platform that operates throughout the UK. As many other platforms in this list, they also consider themselves as a good alternative to high street banks. Thincats was founded in 2011 by Kevin Caley, Peter Brown and Paul Meier, as sort as a response to the banking crisis that began in 2008. The british platform has already raised up to 146 million pounds in loans. Borrowers can get loans from £100,000 to £3,000,000, and terms from 6 months to 60 months; and lenders must invest at least 1,000 pounds in a loan – and there is no maximum investment amount – with an average interest of 9%, meaning they should receive an attractive return on their investment. Although having an elite public, Thincats seems to be trustworthy with high quality control. On the one hand, we should remember that back in 2010, Fairplace arrived with a bombshell in Brazil. It was the first p2p lending service in the country and it has processed around 2.5 million Reais, offering good interest rates and several tax benefits when compared to Brazilian banks. Nevertheless, the platform faced an investigation by the Federal Police, who claimed that Fairplace had violated a brazilian law which prohibits companies that are not financial institutions to operate in financial markets. Its founder Eldes Matiuzzo explained that his company did not provid loans, but instead offered a platform to connect borrowers and lenders. 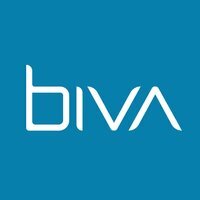 Following in Fairplace’s footsteps, Biva is the second major brazilian p2p platform, founded in 2015. It connects companies who need working capital with people willing to invest in them. The platform facilitates loans from R$2,000 up to R$50,000 for 6, 12, 18 or 24 months. For borrowers, the monthly fees are between 1.5% to 4%; and lenders can enjoy an annual return of up to 25%. The co-founder, Paulo David, has publicly stated how difficult it is for small business owners to get loans for their companies. Therefore, his company’s mission statement is to operate in regions traditionally under-served by banks and the banking system. So far, the platform is doing really well and has already reached up to 2 millions Reais from loans. The Afluenta startup was founded at September 2012. The platform is a bit different from others listed here, due to its need of having a bank account. 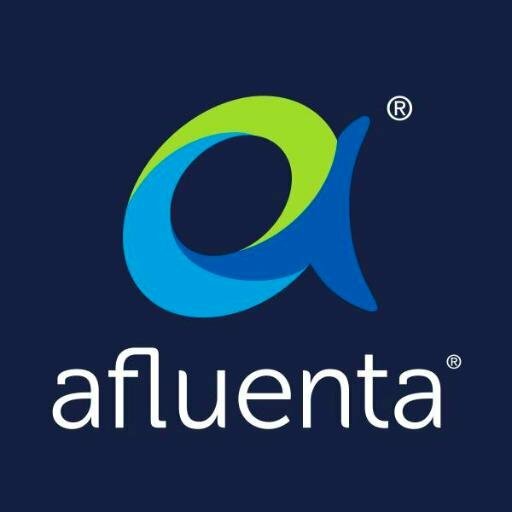 Besides from that, to ask for your loan or to invest your money, Afluenta requests that you are older than 18, born in the operational countries and have both a mobile phone and an email. This is the third part in a series of blog posts written by Stu and Chris on LendAcademy regarding the state of the p2p bitcoin lending industry. This article was written by Chris Grundy, Marketing Manager at Bitbond, who tries to take account of more traditional lending platforms as well blockchain-based solutions. All feedback is encouraged and welcome. Feel free to connect on LinkedIn or via email. In August 2015 I wrote my first installment of the State of the P2P bitcoin lending industry. Since then, we’ve seen seismic shifts across the landscape, with major players declining and new ones taking their place. Here, I want to give you my perspective of P2P lending in 2017, looking at both blockchain-based and more traditional solutions. In this post, I start off by giving a short overview of the p2p lending space as it stands right now, explaining the key developments of 2016. Finally, I outline what the future holds for both bitcoin and non-bitcoin lenders, and show why there are many reasons for 2017 to be a year of growth. According to Orchard’s quarterly report, loan originations across the US industry reached $2.045 billion in Q4 of 2016. Although this is a significant increase from the $1.85 billion reached in the previous quarter, it is still well shy of the $3.8 billion generated in Q4 of 2015. Thus, loan volume has nearly halved since last year, and major player Lending Club as added fuel to the fire with dubious investment tactics. Further bad news from the US-market came from OnDeck, which posted big losses throughout 2016, despite promising originations. Losses for 2017 seem pre programmed, and it is unclear if new business developments can stop the bleeding. In addition to the stumbling loan volume, charge-offs have increased more steeply than anticipated, and impending regulation in China threatens the 5,000 p2p lenders currently operating unsupervised there. 2016 has been a challenging year for the industry. Despite the struggles faced by p2p lenders across the pond, continental platforms have continued to grow and prosper in 2016. Bondora, the Estonia-based marketplace lender, reached €1 billion in processed loan volume for example; a significant milestone for eastern european p2p lending. Latvian neighbour Mintos laid down an equally impressive marker, taking only a year and a half to process over €50 million in loan volume. In the UK, Funding Circle is growing rapidly, surprisingly jumping by 50% since Brexit. Indeed, p2p lending in Britain is dealing with the potential disaster of Brexit far better than most had anticipated. The sector continued to expand in 2016, growing an impressive 39% yoy to £3.2bn, according to research from BondMason. Besides these encouraging signs of growth the industry in Britain seems to be maturing and moving into the mainstream. This is highlighted by Zopa currently seeking a banking licence, as well as the UK government making the first £1,000 peer to peer earnings tax free. Although the numbers in Europe’s p2p landscape are diminutive compared to their US counterparts, they are important signs of growth in a young and thriving sector. Anyone active in the P2P bitcoin lending industry will have noticed the decline of BTCJam and BitlendingClub. Both were stalwarts in the space and regularly set up impressive monthly loan volumes in a niche yet highly disruptive sector of the industry. So what is the reason behind their current struggles, and what does it say about the bitcoin p2p lending industry as a whole? First let’s look at the former market-leader BTCJam. Its decline is particularly striking, as the San Francisco based platform raised more than $11 million in equity funding, eclipsing all competitors in the bitcoin p2p lending field. BTCJam didn’t throw away the money either, managing to generate over $18 million in loan volume across 20,500+ funded loans. The twist in BTCJam’s fortunes came when CEO Celso Pitta stated that the platform was closing its doors to US customers. Since March 2016, US-based borrowers and lenders have no longer been able to open an account with BTCJam. As a result, the number of current loans listed on the platform has slumped to 0, and the subreddit has already claimed the platforms untimely demise. In similar circumstances, BitlendingClub – another major player in the space – announced it was shutting down operations in December 2016. Like BTCJam, BitlendingClub cited growing regulatory pressure as the reason, although here the pressure came from the Bulgarian authorities. Having funded nearly 10,000 loans with a total value of almost $8 million, the decision to shut down BitlendingClub is actually more of a pivoting towards a business lending platform called Loanbase. But still, it is another p2p bitcoin lending platform bit the dust in 2016. P2P lending in 2017 | Still a viable option? Although the skies may have briefly darkened over the p2p lending industry, 2017 will be a time of renewed vigour for retail and institutional investors. Defying the regulatory challenges which other platforms have succumbed to, Bitbond recently received its own licence making the Berlin-based p2p lending company one of the first to do so in the blockchain space. With another successful funding round of $1.2 million closed in early 2017, Bitbond is making sure that bitcoin lending remains a viable option for individuals all around the world for years to come. Bitbond is not the only thriving lending platform in the blockchain space however, as innovative, UK-based startup BTCPop was recently acquired and has since undergone many promising changes. Things seem to be looking up for traditional marketplace lenders as well. Just a few days ago, Prosper finally inked a deal with Soros and Jefferies which could be worth up to $5 billion. The deal stipulates how a vast quantity of consumer loans will be sold to a group of reputable investment firms over the next 24 months. Even the troubled giant LendingClub has shown promising signs of recovery in 2017, beating Q4 estimates and signalling a significant turnaround so far. In Germany, 2017 started off with a bang too, as AuxMoney secured €1.5 billion from Aegon. The Dutch insurance company plans to invest into consumer loans on the platform over the next 3 years. For a european platform, this is a staggering amount of money, and is a great portent of things to come. On the flipside, this massive increase in capital will most likely create a downward pressure on rates, potentially reducing the returns retail investors are likely to make. The good news is, that with so many platforms around, you are sure to find one that matches your risk/return profile perfectly. Thanks for reading, and let me know what you think in the comments below. If society can trust technology in self-driving cars, we can trust technology with our finances. The adoption of technology in the world of money management is a growing trend. More investors are embracing the logic enmeshed in code to create long-term growth. This trust in financial technology, or ‘FinTech,’ fosters a passive environment because investor preferences can be automated without the need for meddlesome oversight. Furthermore, the passive investing approach is desirable due to its ease and rate of return. In this article, we’ll look at the benefits to a passive investing style and how it applies to the emerging field of peer-to-peer lending platforms like Bondora. One of the most popular passive investing products today is the robo-advisor, which is a automated service that asks the investor a few questions about their goals and risk tolerance. Next, the interface uses this input to generate investment diversification in a portfolio comprised of asset classes appropriate to the individual. Once the investor sets the parameters, they step back, and their money is poised for gradual growth. This growth is possible because automated investing removes the emotional impulses of the investor whereas active investing burdens the individual with constant well-timed maneuvers to generate returns. Why is it so important to create a remove from our assets? The field of behavioral economics offers answers by combining cognitive and behavioral psychology to financial markets. The origins of the field belong to researchers Amos Tversky and Daniel Kahneman. In 1979 they authored an article on prospect theory, which endeavors to understand how people misguidedly interpret risk. Their research has lead to a vast body of work revealing numerous cognitive biases that distract us from our goals. A passive investor avoids these pitfalls when the engage in automated investing. Robo-advisors lack these biases. These flaws in our psychology are often rooted in our tendency to ignore the challenges of analytical, mathematical approaches. 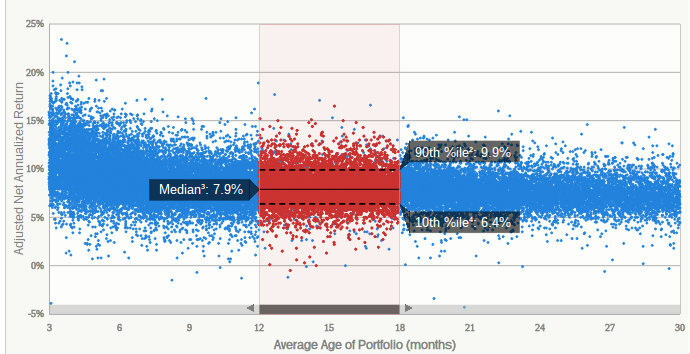 This quantitative analysis is where robo-advisors excel. In seconds a program can analyze thousands of data points to synthesize a strategy. With more investment products available than ever before the data is growing and therefore so is the need for efficient analysis. So how has the passive investor performed compared to active investing? Researchers at Morningstar have the answer. In a 2015 publication, they reported the results of their study designed to “measures active managers’ success relative to the actual, net-of-fee performance of passive funds.” The results illustrate that “actively managed funds have generally underperformed their passive counterparts, especially over longer time horizons.” Results like this have popularized the hands-off approach. The benefits of automated investing are amplified when coupled with the growing marketplace for peer-to-peer lending. Modern P2P platform Bondora has leveraged passivity to enable the user to generate returns without the burden of endless analysis. Therefore, more investors at Bondora are opting for their Portfolio Manager tool. This system analyzes volumes of data to construct a portfolio matching the conservative, moderate, or progressive risk tolerance of the user. The automated investing aspect of Bondora’s P2P lending is important because it strikes a balance between risk and return. The result is an optimized portfolio that accepts the least amount of risk possible while achieving the investor’s goal ROI. How does their framework accomplish this? The answer is investment diversification. By spreading the total funds across various borrowers and credit rankings, Bondora’s investors mitigate risk intelligently. While there are clear benefits to passive investing, those on Bondora’s site that wish to test their investing prowess can do so with the Bondora API system. This tool allows the active investing customer to bid on specific loans based on the nuances of the users goals and risk tolerance. This granular reporting is suited for those who prefer a deeper dive into analytics to achieve a superior return. The world of P2P lending is still developing, and some of those on the ground floor believe they can realize the value of accessible data to beat the market. Bondora’s Portfolio Manager and API framework are critical to today’s investors because it creates an efficient P2P platform. The result is a more accessible marketplace for lenders and borrowers alike. In under-banked regions more borrowers are turning to peer-to-peer lending. In many cases, borrowers with strong credit are unwilling to withstand the drag and bureaucracy of traditional lending institutions. On the other side of the transaction investors are turning to P2P lending as an investment product because of a prevailing notion that there will be “more muted returns, if you will, over the next decade” as asserted by Vanguard CEO Bill McNabb. Those wanting to improve this tepid forecast will be attracted to an annualized net return on investment of 16.5% seen on Bondora. Though the benefits of passive investing are well understood, it is the FinTech industries influence that’s popularizing its adoption in P2P lending. This technological growth emboldens investors to explore the nascent world of marketplace lending. While high investment returns and investment diversification will keep an investor partnered with a company, it’s the ease of investment opportunities that will get them in the door. Online investing promises greater advances in technology as a primary differentiator among competitors. Ever-increasing efficiencies have driven down many costs. Now, prospective investors are looking to auto investing solutions to carry them to their goals. This automation is the same technological growth that has given rise to the world of marketplace lending. The value of peer to peer lending has always been clear, but technology has made it tangible. Passive investing has never been more applicable than it is for P2P lending. Auto investments deter cognitive biases which lead us astray, makes unlimited data manageable and minimizing costs. Before painstakingly committing to an active style consider the compounding value of passive investing in the marketplace lending sphere. Disclaimer: Viventor provided €50 to start investing and try out the platform. This has not coloured the authors opinion of the platform or influenced this review. Viventor opened its doors to lenders almost a year ago. Founded by Prestamos Prima CEO Andris Rozenbahs, the Riga-based platform offered loans secured by mortgages, and a buyback guarantee for all investments. Since then, mortgage-backed loans have broadly made way for short-term consumer loans, which now make up a vast majority of listings. These still come with the buyback guarantee and are 100% pre-funded. Both the buyback guarantee and the pre-funding of loans show Viventor’s safe approach to lending. It runs as an ethos throughout the platform and allays any fears investors might have about investing. With safety so high on the platform’s list of priorities, it unsurprising that expected returns for investors are slightly lower than on most competing platforms. Mr. Rozenbahs said when the platform launched: “Keeping in mind that these investments generate a fixed annual return of 6% and above – I’d say it is a solid deal.” With cumulative investments breaking through the €6 million mark, and over €45,000 in earned interest, many investors seem to agree. These numbers now serve as the driving engine of Viventor’s success, along side the low entry-barrier to investing. This stipulates a €50 minimum deposit and €10 minimum investment. Before we delve into the features, let’s briefly discuss if you are eligible to invest. Peer to peer lending platforms define themselves by the quality of their features. Nothing is more frustrating than a laggy AutoInvest, or an illiquid secondary market. On the other hand, a smooth user experience, slick navigation and easy investments are the hallmarks of this verticals top performers. Viventor offers three main features: the Primary market, the Secondary market and AutoInvest. The platform boasts an excellent Primary market with over 1,000 loans currently listed. These are primarily from Spain and Sweden and originated by third parties like Twinero. Loan terms range from 1 to 72 months, with shorter loan terms significantly outnumbering longer ones. As a result, investors can enjoy a high liquidity as repayments come flowing back at the beginning of every month. 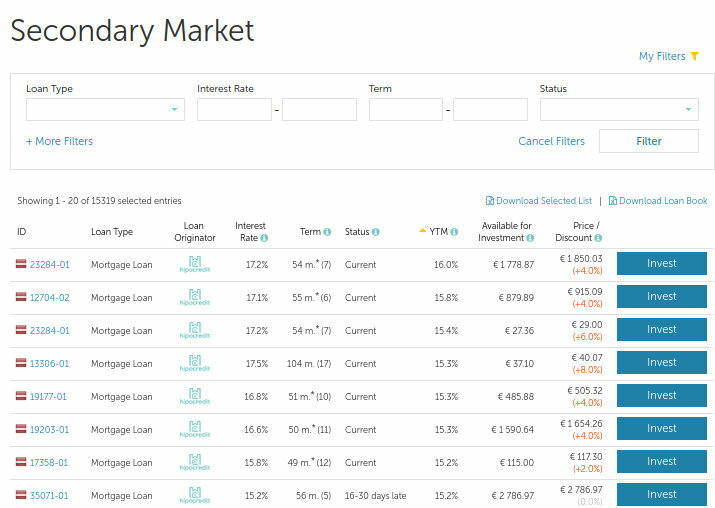 Understandably, loan amounts vary by loan term, with shorter terms often coming in at under €500, while longer terms go all the way up to €150,000. As with all peer to peer lending platforms, the watchword here is diversification I try to avoid larger single investments anyway. To help martial and segment the vast number of listings, Viventor has provided a pretty cool filter. This allows you to set your desired interest rate, loan term and loan status. 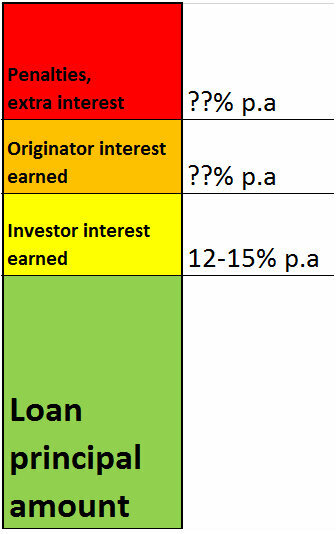 The loan status refers to whether a loan is being paid, late or defaulted. As of today (06/10/2016), there is not a single late or defaulted loan listed on the platform. 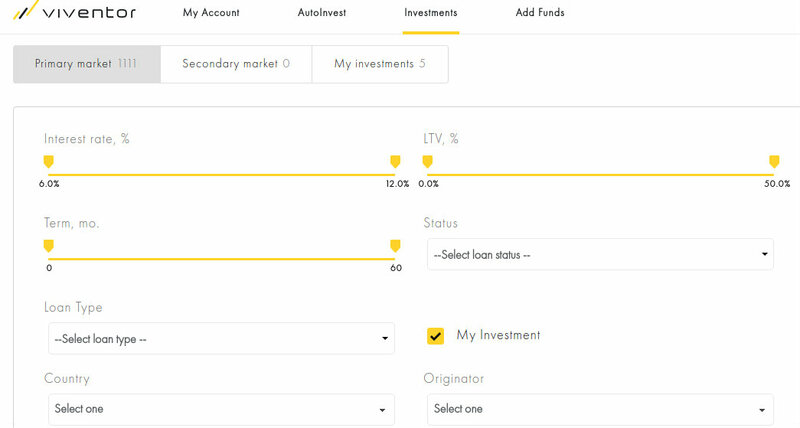 On the top right of the screenshot, you can see the option to filter for LTV, which refers to the loan-to-value percentage of the listing. A high LTV means that the loan amount represents a high proportion of the borrowers asset value. Setting the filter high, will provide you with a list of larger loans, mostly backed by a mortgage. Below is a good example. Viventor’s secondary market is one of the coolest features on the platform. Essentially, it allows investors to exit an investment before it has reached maturity. This particularly handy should you need your money back to pay for bills, or unforeseen expenses. 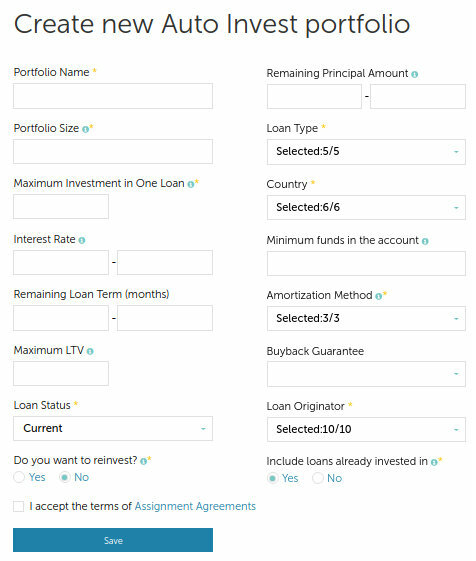 You can take advantage of this feature by listing your stake in a loan on the secondary market. Other investors then have the opportunity to purchase your stake in order to grow their portfolio. In order to speed up the sale, you can sell them at a discount or even add a premium. With ~791 stakes listed, investors are sure to pick up some great deals. As expected from any major peer to peer lending platform, Viventor brings its own AutoInvest feature to the table. 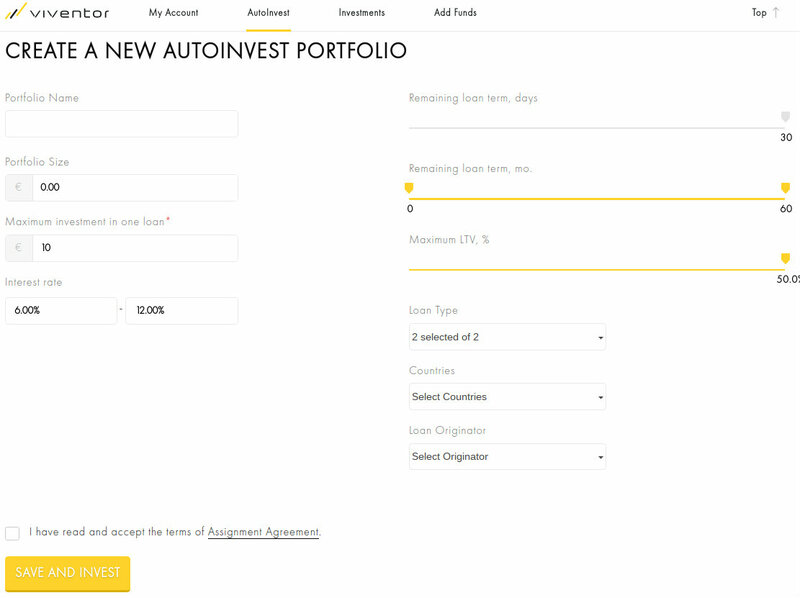 If you’ve never heard of AutoInvest, you should know that it allows you to create an automated investment portfolio based on your chosen criteria. Essentially, it filters the available loans through your predefined filters and automatically invests your desired bid amount. This is fantastic for anyone looking to save time and ensure easy diversification. What’s great about Viventor’s AutoInvest feature in particular, is its ease-of-use. You can set your preferred parameters and turn on AutoInvest in just a few minutes and straight away your investments are made. This makes a nice contrast to many similar features which take weeks or even months to place bids. Viventor’s advantage here is the ample supply of loans on the primary market. Additionally, I should mention that using AutoInvest comes at no extra cost to you, and you can still place bids manually should you so choose. I invested €10 each across 5 loans and waited for the due dates to arrive. You can find the borrowers repayment schedule by heading to the listing and clicking on “Payment Schedule”. While waiting, I came across the Viventor fellows facebook group, which is an excellent place to find fellow investors and ask questions. 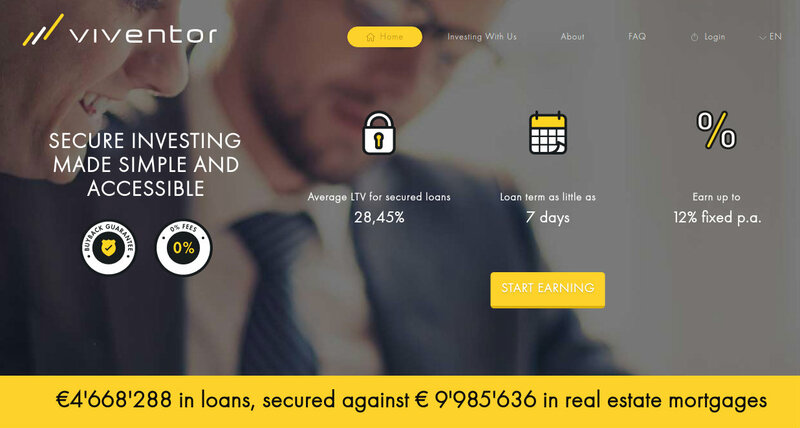 Viventor is doubtlessly one of the best European peer to peer lending platforms. The slick interface and smooth usability make it incredibly easy to earn interest. The buyback guarantee coupled with the high loan quality make Viventor the definitive safe option for European investors. With a minimum deposit of €50 and minimum investment of €10, investors new to peer to peer lending can dip a cautious toe into the water before committing. Additionally, your dashboard is filled with helpful tips and explanations, making the investment process even easier. For more sophisticated investors, the AutoInvest feature is easy to set up and boasts 7-13% per annum ROI. Every review needs an honest appraisal of potential weak spots, and there are a few things that struck me while getting to know the platform. Perhaps the most important weakness of the platform is how impersonal it is. No doubt many investors will prefer it like this, but I really enjoy investing in people and not just ID numbers. I think Viventor could make investing even more fun by including some information about the borrower and allow for some interaction. My second bugbear is the slight lack of information in the dashboard. Above you can see a screenshot from my dashboard as of October 6th. Beside this breakdown I can see a small summary of my activity, including the percentage interest earned and other core kpis. On platforms like Bondora and Mintos users are provided with a more granular breakdown of their portfolio performance as well as an indication of performance in relation to other users. I find these particularly helpful as they help sign-post my success as an investor. Overall, Viventor is a hugely enjoyable platform to invest on. The user experience is excellent and the buyback guarantee offers peace of mind. It takes no time at all to set up an account, and the Auto Invest feature makes it easy to spread your bids, ensuring diversification and (hopefully) maximizing revenue. After only a month on the platform, there is still plenty to learn but Im looking forward to the journey ahead. 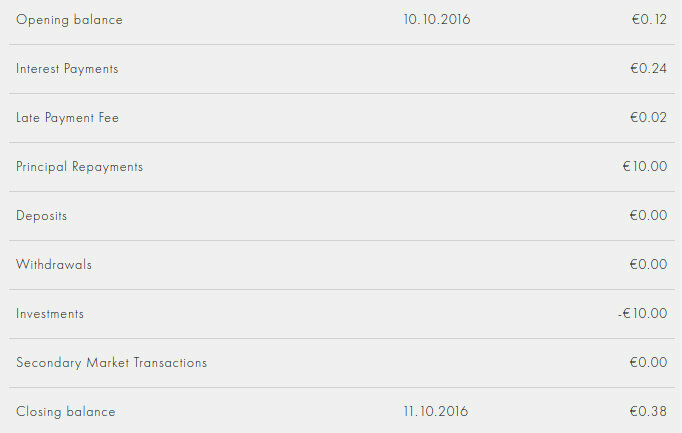 Here is my account balance so far, roughly a month after I started investing on Viventor. Being such a new platform, there are clearly still aspects worthy of improvement. The relative lack of granular data is perhaps the most glaring in this regard, but it does little to detract from the overall quality and enjoyment of the platform. Thank you for reading this Viventor review. Twino Review – Mentioning Twino to most European investors induces little more than a shrug of the shoulders and a muffled “never heard of them”. Not an unsurprising response, given the platform only launched in 2015, and has kept a relatively low profile compared to competitors like Bondora, Mintos and Bitbond. A strong gut feeling suggests however, that Twino will soon emerge from the backwaters of European p2p lending, and take its place among the market leaders. Why do I think so? Let’s take a look! Launched by the Finabay Group in 2015, Twino offers investors from across Europe the chance to earn healthy returns by investing in unsecured p2p loans. These are consumer loans from Poland, Georgia, Latvia, Czech Republic, Russia and Denmark, commanding interest rates between 10-40% per annum. Loan terms vary between 1-24 months, giving investors more flexibility in the short term, but potentially lower returns in the long term. Returns seem to be healthy however, and investors have reportedly earned €600,000 in interest. Not bad in 11 months. One of the reasons Twino’s growth has been so rapid, is its accessibility to investors from the Euro-zone AND Great Britain due to a partnership with Swedbank. As a result, investments can be made in euro (EUR) or British Pound (GBP), with the minimum being €/‎£10 . This was doubtlessly a shrewd move by CEO (and former Bondora CMO) Jevgenijs Kazanins, because it opens the platform up to the more mature British Peer-to-peer lending market. Another reason the Latvian marketplace lender is doing so well, is its highly popular “BuyBack Guarantee”, which promises to repay the investor principal plus interest, if a borrower is 30 days overdue on a payment. Most loans on Twino come with this guarantee and are sign-posted with ( ). This feature is proving particularly attractive to German investors who are typically risk-averse and make up a majority of the platforms’ investors. But how can Twino sustain a BuyBack guarantee like this? Especially in the face of zero fees for investors? Well, the answer is Twino’s business model, which relies on a large gap between the returns that investors make, and the interest rates borrowers pay. As highlighted by the excellent Money is Your Friend, most loans on Twino are payday loans with likely interest rates of 100% or higher. Interest rates offered to investors, as already mentioned, only range from 10-40%. The resulting margin is what Twino relies on to keep the BuyBack Guarantee viable and the business afloat. For investors, this means BuyBack is unlikely to disappear anytime soon, as Twino’s business model depends on it. Additionally, the marketplace lender needs the feature to onboard new investors. With over 15% of all loans “delayed”, the platform would otherwise have a hard time turning a profit for its users. The feature doubtlessly offers investors a greater level of security, but still depends on the profitability of the originators, which back the loans. You can easily automate your investments along strict parameters with Twino’s Auto Invest feature. A particularly welcome part of the investing experience, as it allows to easily diversify funds across a large number of loans, spreading risk in the process. The huge number of loans on the platform, ensure that no matter which parameters you pick, the Auto Invest tool will be able to diversify aptly. Once you have automated your investments, head over to the “My Investments” tab to see it in action. Twino simply offers a great experience for investors. The security of the BuyBack Guarantee, coupled with an easy to use AutoInvest feature, and slick interface combine to create a winning experience for anyone looking for easy passive income. 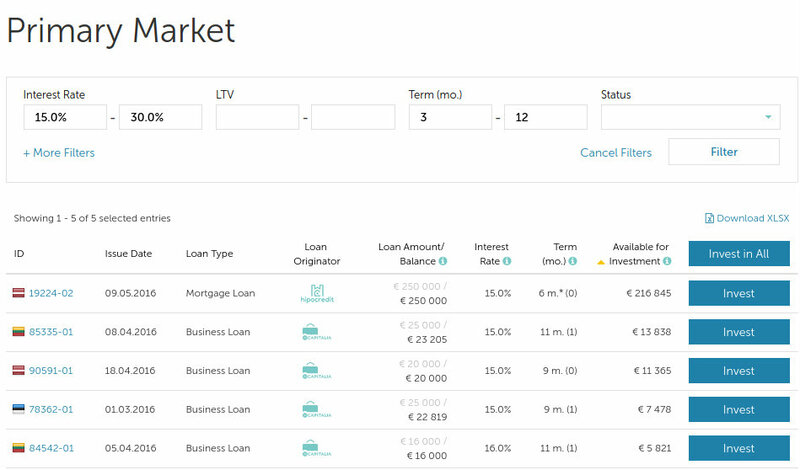 There are hundreds of loan listings to choose from and the low, €10 minimum investment, ensures that everyone can start investing. Uk investors will also be delighted at the prospect of finding an eastern European marketplace, which allows lending in British Pound. This is sure to give Twino the edge over similar competitors lacking in this department. With returns averaging around 12% p.a. for most, and almost 15% for some, Twino is proving its worth to investors around Europe. There are only two aspects of Twino I’m not 100% on board with. The first, is the nature of the loans, and the exorbitant interest rates charged to borrowers. I prefer to invest in working capital loans, with reasonable (max 40% p.a.) interest rates for borrowers. 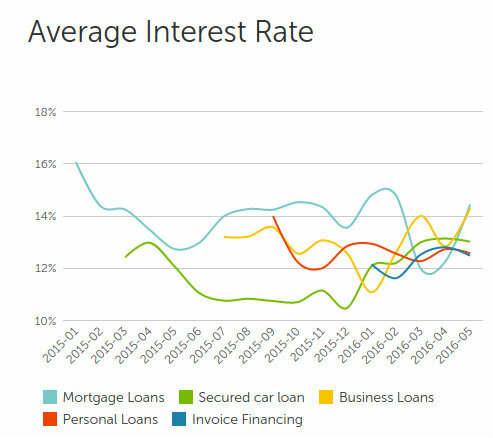 On Twino, we are dealing with Payday loans with interest rates going much higher than that. The second aspect is the lack of personability on the site. Twino might as well be a bank, rather than a Peer-to-peer marketplace, because investors get little-to-no information about the borrower. I understand that this is not a problem for most investors, but my personal preference is to feel like I’m helping people, not just making a profit. Those are my only two bug-bears and they do little to diminish the enjoyment of the platform. Twino is clearly a platform on the rise. The 30 days BuyBack Guarantee along with the sleek Auto Invest feature, provide a high level of security which is hugely appreciated by investors. The impersonal style of the listings however, takes some of the humanity out of the platform and makes p2p investing a little less fun than on other platforms. PS. Have you tried out Twino? Let me know what you think of the Twino review in the comments below! 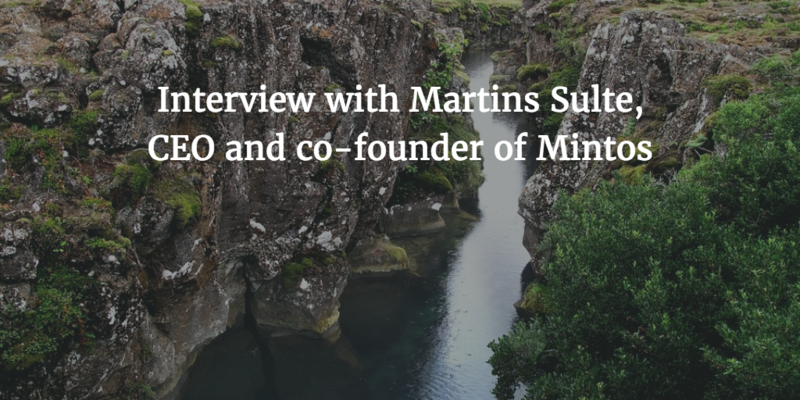 This is an interview with Martins Sulte, CEO and co-founder of Mintos. We have previously reviewed Mintos in depth and now we get to learn more about the platform straight from the CEO. Can you start by telling us what Mintos is about? Mintos is a fintech startup. We operate as a p2p loan marketplace that allows investors to invest in various loans from a constantly growing number of loan originators. To put it in a broader context, Mintos marketplace functions similarly to the way Amazon does. While Amazon connects merchants selling goods to consumers, Mintos connects loan originators selling loans to investors. By creating this service, the Mintos team offers investors an asset class that previously was not widely available — the opportunity to finance loans originated by non-bank lenders, who have traditionally funded loans using their own balance sheet. In our model, non-bank lenders become loan servicers, dispersing proceeds and collecting interest and principal payments from a borrower. What has been Mintos marketplace’s track record so far? Since its launch one and a half years ago, the company has seen great traction. More than 40 million EUR in funded loans have been traded via the Mintos marketplace. To date, 10 non-bank lenders have joined the platform; they provide loans in the Czech Republic, Estonia, Georgia, Latvia, Lithuania and Poland. More than 8,000 investors from 40+ countries across the world currently use the Mintos marketplace. What return on investments can investors expect? So far, we have seen an average net annual return of about 12.5% for investments made through the Mintos marketplace. We encourage investors to diversify their portfolios. By offering different loan products in different geographical locations, along with a low minimum investment of EUR 10, Mintos allows investors to easily build well-diversified investment portfolios. Investors can finance business loans, car loans, invoices, mortgage loans, and personal loans on the Mintos marketplace. All loans on the platform are pre-funded by loan originators; investors can start earning from the moment they invest with no cash drag. Moreover, loan originators on the Mintos platform are required to retain a part of each loan on their balance sheet. This means they have “skin in the game” that aligns their interests with those of investors. With the Mintos marketplace’s current origination volume of EUR 150 million per year, there are always plenty of loans available in which to invest. It is also crucial for us that non-bank lenders on our platform are experienced in underwriting; therefore we do our due diligence vetting potential loan originators before adding them to the marketplace. How would you describe your typical investor? About 70% of total investments come from Estonia, Germany, Latvia, and the UK. As more investors learn about Mintos, the balance is increasingly shifting to Western Europe, where saving and investing culture is more developed. Today, the Mintos marketplace connects investors from Western Europe with borrowers in the Eastern part of the continent, facilitating free movement of capital within Europe. What brought you to the field of p2p lending? I come from an investment banking background, having worked in the industry for six years before going for an MBA at INSEAD. Financing my MBA was actually my first brush with p2p lending. I borrowed from Prodigy Finance, a platform that provides funding to international postgraduate students attending top-ranked business schools, while also delivering competitive financial returns to institutional and private investors. After graduating from INSEAD, I was eager to prove myself an entrepreneur, and the peer-to-peer industry seemed to be a dynamic place with great potential. Mintos is a venture capital-backed startup – the company closed EUR 2 million seed round from Riga-based venture capital fund Skillion Ventures in February 2016. Mintos’s owners are its co-founders, a venture capital fund, and employees who hold company stock options. How are your operations regulated? Mintos is regulated by Latvian legislation. Currently, no specific laws have been introduced regulating peer-to-peer lending, but the Latvian government is working to create a legal framework by the end of 2016. However, Mintos has applied for a license issued by the Financial Conduct Authority of the UK, and expects to obtain it by the end of this year. We aim to be a serious player in the European market – one that provides a free movement of capital enabling integrated, open, competitive and efficient financial markets and services that work for the benefit of investors and borrowers. We ultimately believe that we create favorable conditions for the growth of the whole non-banking sector, thus making funds more accessible to individuals and small- and medium-size businesses. If you’re interested in joining Mintos, you can do so through our affiliate link here. This allows you to receive 1% of your investment credited to your account. This is paid in 3 installments for the first 90 days. The investment reward will be calculated after 30, 60 and 90 days from the registration date and be based on the average daily balance. Once you are paid after the first 30 days you will only receive an additional credit on increases to your initial investment. With ROIs topping 12% per annum, it’s tough to beat Mintos right now, which is why this review is a necessary addition to the Peer Social Lending blog. Before we get into the nitty gritty of this Mintos review however, let’s tackle the basics. Founded in 2015, the eastern European peer-to-peer lending platform has originated close to €40 million and counts +8,000 investors among its ranks. Average net annual return is +12% although myself and Wiseclerk are both making slightly more than that. And so will the equity investors who have funded the Riga-based fintech startup to the tune of $2.2million in venture capital. As is the case with most peer to peer lending sites, the story of Mintos really begins with the credit crisis of 2008-09, when asset values of eastern European banks slumped by two-thirds. As a result, the banks shut their doors and loans became extremely hard to come by. This left the eastern European market wide open, allowing platforms like Mintos and Bondora to fill the gap left by the banks. Key to understanding their success is the SEPA region which allows investors from around Europe to fund eastern European borrowers. Because of the Euro, lenders from any of the 35 member states can invest and make high returns. Unsurprisingly, in the face of 0.5%-1.5% interest offered by the banks, many German, French, and Swiss investors are grabbing the high-yield bull by the horns and flocking to the gates of Mintos. As a result, Mintos.com receives around 210,000 visits a month from yield-hungry, yet safety-conscious investors, spurring on its already encouraging growth. And so far, this story is missing one key component: some loans on the platform are secured by the borrower’s real estate. This aspect has been key to allaying investors fears, who traditionally pursue more conservative investment opportunities, having had their fingers burnt on the stock market since the turn of the century. Be sure to check which loans are backed by real estate as it is stated on those particular loans. With that under our belt, let’s take a look at the platform feature-by-feature in order to get a good idea of its quality and attractiveness for private investors like you and me. The loan listings represent the beating heart of any peer-to-peer platform. In Mintos’ case, that heart is beating to the tune of 3854 investment-ready loans listed in the Primary Market. For diversification-addicted lenders like me, this is the ideal scenario. Literally thousands of borrowers ensure that any lender can spread risk and protect his/her portfolio effectively. You still carry the risk of regional economic turmoil, as all borrowers are either from Latvia, Poland, Lithuania, Estonia or the Czech Republic, but most loans are secured with real estate, so even if eastern Europe should face economic apocalypse, investors money is (relatively) secure. Additionally, all loans on the platform are provided not by Mintos itself, but by third party loan originators. As a result, certain loan originators can offer a buy-back guarantee, which means that if the loan is delayed for 60 days, the loan originator repurchases the investment for the nominal value of the principal and the accrued till the date of repurchase. Interest rates typically range between 7% to 14%pa. 0% fees for investors on the primary market. 1% fee on any sale on the secondary market. The shield visible in some of the “invest” buttons signifies those loans which come with a buy-back guarantee from the loan originator. These are my favourites, providing an excellent risk-to-return ratio, and giving my stressball some much needed alone time. As you can see from the screenshot, the borrower, collateral, payment schedule and investment breakdown are readily available at the bottom of the page. How good is the Mintos’ Secondary Market? The secondary market forms the backbone of Mintos’ business model so I expected it to come at me all guns blazing. I was not disappointed. Very liquid, easy to use and relatively cheap, the secondary market is one of the best in the business. Whenever a loan on my books approaches the 30 days overdue mark, I list it. After swallowing the 1% fee and offering a discount of around 3% to 4%, I still receive the outstanding principal plus interest back, which is substantially better than a default. What about Mintos’ Auto Invest feature? 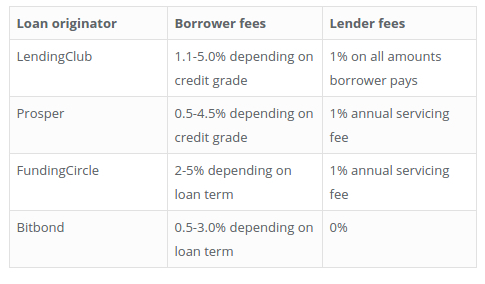 Interestingly Auto Invest does not invest in loans from the secondary market. This feature may well be added later, as many lenders with a bigger risk-appetite than me, look to scoop up discounted gems. With the core features out of the way, it is time to dedicate a little bit of space to the excellent usability of the platform. From the outset, Mintos is pleasing to the eye, and boasts a slick interface with unobtrusive load-times. Once signed-in, the platform is easy to navigate and the F&Qs present answers to most of the questions users may have. On top of that, customer support responds to questions within a day or two, and visitors can leave questions and feedback from the homepage. All-in-all, the platform is a real joy to invest on. Mintos’ is an attractive proposition for lenders located in the SEPA area. The average net annual return is higher than on most competing platforms, and the usability is excellent. The liquidity of the secondary market is encouraging, and the repayment rates are reassuringly high. The Auto Invest feature works well, and the impressive number of loan listings allows investors to diversify to their hearts content. The world of Marketplace lending seems to have fallen into complete disarray in recent times. Prosper had to lay off 28% of its workforce earlier this month, Lending Club’s CEO resigned, and OnDeck’s performance left many analysts disappointed. It’s fair to say, that May has been a month to forget for US’ peer-to-peer lending platforms. Across the pond however, European platforms are providing a huge amount of fun for those of us who have taken the plunge with a peer to peer investment. Today, I want to talk about the three European platforms I have been enjoying the most: Bondora, Bitbond and Mintos. Let’s get cracking! My peer to peer investment experience on Bondora has been joyous. 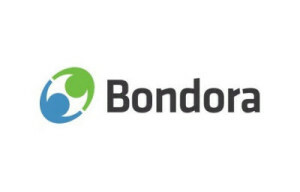 Founded in 2009 by the exciting young entrepreneur Pärtal Tomberg, Bondora is quickly establishing itself as a major player in the European Market. The platform boasts a net annualized return on investment of 17.56%, and over €63 million in loan originations. Although 17.56% seems a little high from where I am standing, the excellent Claus Lehmann has seen returns around the 17% mark. As a result lenders located in the SEPA region can make their peer to peer investment, safe in the knowledge that they will make a return. Initially, it seems that lenders couldn’t have it any easier on the platform. You simply add funds your Bondora account, set a desired bid size, choose your risk profile and activate your portfolio manager. As you can see from my Screenshot, I have opted for the “Balanced” approach which gives me an expected return of 14.88%. The funds will then automatically disburse into loans which fit your risk profile. Easy. Importantly, this only applies if you do not activate your portfolio manager. Another important feature for peer to peer investors, is the thriving secondary market Bondora offers. Here, you can make a particularly cheap peer to peer investment. Subsequently, though the repayment rates are lower and the corresponding risk of default is higher. Overall, Bondora is going from strength to strength and is providing a huge amount of fun to p2p lenders like me. Long may it continue. 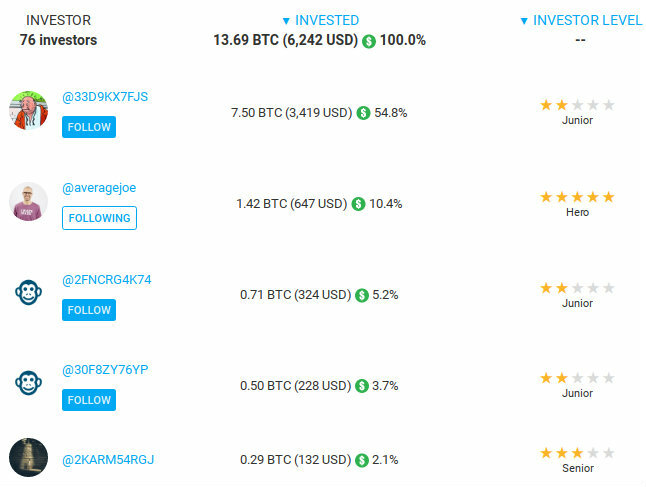 I first came across bitcoin peer to peer investing over Stu Lustmann’s excellent p2p lending blog. Specifically, it was his earning report for May which peeked my interest. Fascinated, I started researching the bitcoin lending space, and decided to invest in Bitbond. By documenting my experiences along the way, I have tried to spark other traditional p2p lenders into giving it a shot. But before we go into my experience on the platform, let’s take a step back to understand what Bitbond is really about and why I think it’s fascinating. Founded in Berlin, 2013 by Radoslav Albrecht, the fintech startup has received ~€1 million in VC funding and has been growing at a significant pace for the last year or so. Now counting +30,000 users, the bitcoin lending platform specialises in providing small business loans to borrowers around the world. The international aspect of Bitbond is exciting, and is the reason why bitcoin is used. By cutting the banks out of the process, lenders can place a peer to peer investment and borrowers can take out a loan regardless of location. The thought of supporting small business owners globally seemed pretty cool to me, so I started investing. As I suspected, the more personal experience Bitbond offers has proven itself to be massively enjoyable. Currently, I am supporting an eBay powerseller from Portugal, an Indonesian Taxi Driver, and an Entrepreneur located in the Philippines. On the flipside, the risk investors take on is substantially higher than on the other platforms mentioned here. Borrowers are often still becoming acquainted with bitcoin technology, which can also delay repayments by a couple of days. Fundamentally though, my portfolio is looking pretty good. Another important point, is Bitbond’s transparency. All investors are listed on the loan pages (with pseudonyms), and can communicate with the borrowers directly via the comments sections! Overall, the investing process on Bitbond is more personal but less efficient than on Bondora. You can however activate the AutoInvest feature, to automate your peer to peer investments, but I have chosen against this to maintain the human aspect of the platform. Finally, you might be saying: “I don’t have bitcoin and don’t know how to get some, so peer to peer bitcoin lending isn’t for me.” Well, you’re entitled to your opinion, but buying bitcoin on Bitbond is as easy as transferring funds on Bondora. As long as you are in the SEPA region, you will be able to buy bitcoins directly on Bitbond. For those of you located outside of the EU, use Circle or Coinbase to get your bitcoins at zero exchange costs. I think bitcoin peer to peer investments will be massive in the future! Significantly younger than both Bondora and Bitbond, Mintos, the Latvian p2p loan marketplace, was founded in 2015. Intriguingly, Mintos harbours some significant differences to other peer to peer investment platforms, because it brings together investors and loan originators! These include Mogo, Capitalia and Debifo among others. From an investors perspective, this makes the process a tad more anonymous but that’s not a KO-criteria for me. Mintos is probably the least well known platform of all three discussed here. It’s relative obscurity belies its massive size however, with over 4000 loans listed in the primary market and a staggering +11,000 in the Secondary Market. With so many options, what can lenders expect from their peer to peer investment here? Like Bondora, Mintos specialises in bringing European investors together with Eastern European borrowers. Below you can see their loan originations by country to get a better feel for the platform. As per the industry standard, the interest rates for borrowers, depend on the quality as well as the purpose of their application. 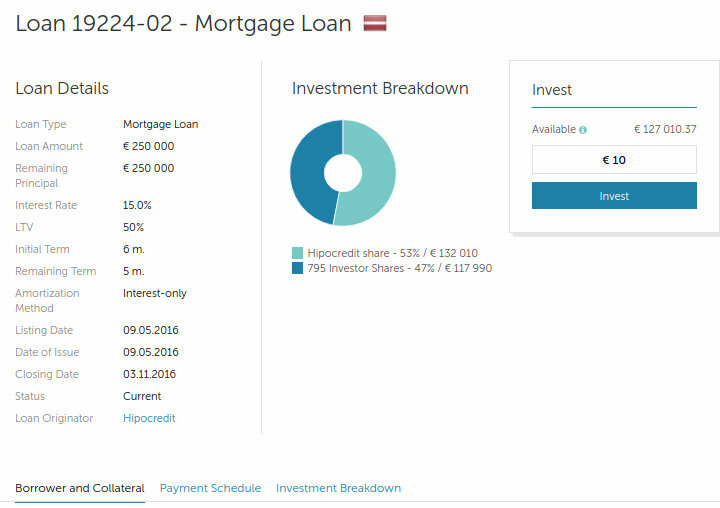 As you can see from the Screenshot below, in May of this year, “Invoice Financing” at 12.48% and a “Mortgage Loan” at 14.44% represent the low and high end of the spectrum in terms of interest rates. What sets Mintos apart, is the very high level of security offered to Investors. Indeed, most loans on the plattform are either secured – ie. the borrower provides collateral – or come with a buyback option if the borrower is +60 days late on his payments. As a consequence, the interest rates are lower than on the other platforms, and so is the potential payout to investors. Surprisingly Mintos does not (to the best of my knowledge) provide statistics with regards to the average ROI, but my personal experience has been ~9% pa.
Like this investor however, I think that Mintos could do with increasing the number of short term business loans available on the platform. Overall though, Mintos is an excellent platform which I will continue to enjoy for some time to come! 2015 was the year of peer to peer lending. Prosper, Funding Circle, SoFi and LendUp each raised over $150 million and originations reached new, staggering heights. 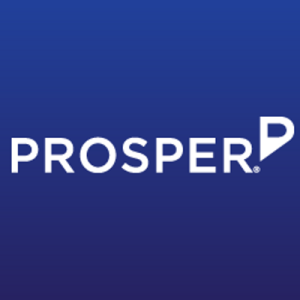 Prosper originated $3.7 billion in loans, more than doubling their previous year’s originations, and Lending Club is estimated to have originated around $8 billion in loans in 2015. Globally, the origination volume has been doubling annually, and is set to reach a jaw-dropping $290 billion by 2020. So, with peer to peer lending the hottest thing in fintech right now, let’s take a look at the likely developments, both in europe and across the pond, that will shape 2016. When Zopa launched in 2005, the idea was a simple one: the democratisation of finance. Everybody above the age of 18 should be able to receive the funds they need, if a large enough number of lenders could be persuaded to part with their cash. The reality of this philosophy could be observed in their US counterparts as well, Lending Club and Prosper, where all loans in 2008 were fractional. This meant that individual lenders parted with a little bit of cash and came together to collectively fund bigger loans. Peer to peer lending has come a long way since then, although not all developments have been for the better. One trend we observed in 2015, and will only grow in 2016, is the increasing number of institutional investors hogging the p2p market. Thus, peer to peer lending has come to the attention of fund managers seeking higher yield investments. As social lending grows further, and credible alternatives remain few and far between, we expect the number of fund and asset managers participating on p2p platforms to increase significantly in 2016. As in any part of finance, the regulators will have a huge say in the developments of peer to peer lending in 2016. With the market size constantly growing, however, and the nature of the beast continuously changing, regulations are often proved obsolete shortly after coming into effect. In the UK, the Financial Conduct Authority has been regulating the domestic industry since 2014. To its credit, the body has gone to great lengths to craft a set of rules and regulations specific to peer to peer lending in the United Kingdom, addressing specific risks faced by the people involved. In the US however, regulation is far less specific, and is often the result of precedent cast by an overlapping industry. Additionally, and in great contrast to the UK and Europe, the lack of a tailored regulatory corset has stifled the industry in the US, inhibiting growth and innovation. As an example, take peer to business lending in the US. You may have noticed it is almost non-existent, despite being a thriving market across the pond. This is vexing because, where implemented, P2B provides a crucial financing option for small businesses with nowhere else to turn to grow and maximise their revenue. Unfortunately they so often find it impossible to comply with the muddled legal framework, that they fail to operate on a meaningful scale. On social lending platforms, interest rates are designed to correlate with the risk of default. So, if the risk of default goes up, so do the interest rates. Once the risk of non-repayment goes down, then so do the interest rates. Simple enough. The Federal Reserve on the other hand, increases or decreases its interest rates in accordance with the general health of the US economy. The economy is strong? Interest rates are kept high. The economy is showing signs of weakness? Interest rates are lowered. This mechanism is basically how economies around the world battle inflation and deflation, keeping prices stable and purchasing power on an even keel. Thus, with the US economy finally showing signs of strength, the FED raised short term interest rates for the first time in nearly a decade, in December 2015. Macroeconomic policy changes such as this will play a vital role in determining the success or failure of social lending platforms in 2016. As origination fees are the key source of revenue for peer to peer marketplaces, a decrease in the number of borrowers, or a decline in the number of successfully funded loans, will have a huge impact on the health of social lending platforms in the US. Thousands of miles away, peer to peer lending will face similar challenges from economic policy in europe in the near future, as the ECB pursues an aggressive fiscal agenda. Pushing its deposit rates further into negative territory and increasing bond purchases will result in an increase in commercial lending from europe’s biggest banks, challenging the arguments for p2p platforms. One potential benefit for social lending platforms may be, that banks decide to pass on the cost of negative interest rates pushed on them by the ECB. This would result in mass withdrawals and a desire to reinvest or store that money somewhere safe and profitable. Peer to peer lending companies may well provide the perfect alternative. On the other hand, if borrowing becomes cheaper and more readily accessible from commercial banks, borrowers may well decide to go the traditional route and pursue funding from banks rather than social lending platforms. Either way, europe is currently sailing into unknown waters and it remains to be seen what the effect of peer to peer lending will be in 2016.